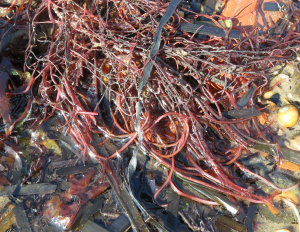 Observation - A Stringy Red Seaweed - UK and Ireland. Description: One of several kinds of red seaweed washed up on beach. There were so much seaweed the shore was red. One of several kinds of red seaweed washed up on beach. There were so much seaweed the shore was red.